Exodus 29:12, Horns of the altar. 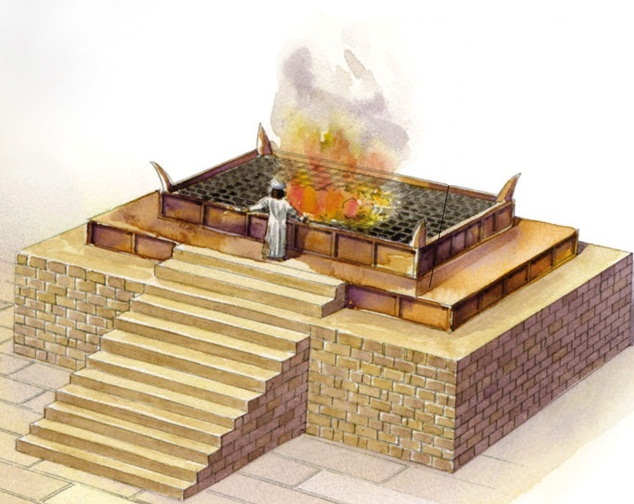 The four horns of the altar of sacrifice was the place where the blood of atonement was sprinkled (also Lev 4:4, 17, 18, 25, 30, 34; 8:15; 9:9; 16:18). As we continue our tour of the Tabernacle of Moses, the Torah takes us next to the bronze altar of sacrifice just inside the tabernacle’s door. Everything occurring in the tabernacle revolved around this altar—EVERYTHING! This fact is highly significant, since this altar points to the “altar” of the cross on which Yeshua the Messiah died for our sins. This is one truth that the mainstream church has gotten wonderfully right: the cross and what happened there is the central point of the gospel message. One cannot read the writings of the apostles and fail to see this unless one is sadly spiritually naive and spiritually blind! Exodus 27:1–8, An altar. As we continue our tour of the Tabernacle of Moses, the Torah takes us next to the bronze altar of sacrifice just inside the tabernacle’s door. Everything occurring in the tabernacle revolved around this altar—EVERYTHING! This fact is highly significant, since this altar points to the “altar” of the cross on which Yeshua the Messiah died for our sins. This is one truth that the mainstream church has gotten wonderfully right: the cross and what happened there is the central point of the gospel message. One cannot read the writings of the apostles and fail to see this unless one is sadly spiritually naive and spiritually blind! 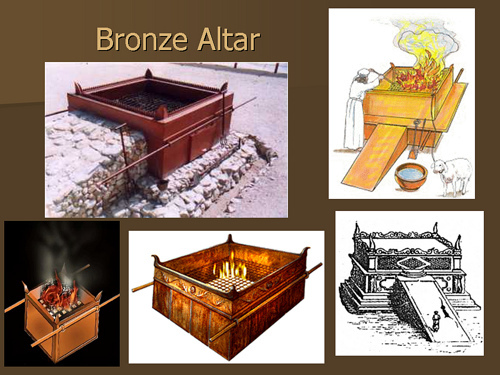 Just inside the door of the tabernacle was the altar of sacrifice. It was made of acacia wood overlaid with bronze, which is a prophetic picture of Yeshua the Messiah bearing the judgment for men’s sins on the cross. The blood of the sacrifice was poured out on the ground at the base of the altar symbolically picturing Yeshua shedding his blood at the cross. Two lambs were offered at the altar morning and evening (Exod 29:38–42). This pictures our need to come humbly before our Father in heaven morning and evening in prayerful devotion as living sacrifices to confess our sins, to praise and thank him for saving us from the penalty of our sins, which is death (Ps 51:16–17; Heb 13:15; 1 John 1:7–9; Rom 6:23).